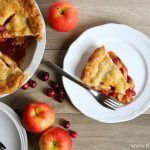 Cranberry apple pie is a classic pie recipe to make for the fall and winter holidays. Tart cranberries and juicy, sweet apples baked inside of a flaky butter crust. The day before you plan to bake the pie is a great time to make your dough. Pie baking can seem overwhelming at first, but broken down into a 2-day process it becomes pretty simple. The dough needs time to refrigerate before rolling it out so this step is crucial if you're looking for rich, flaky pastry. Add the flour, sugar and salt to a large bowl and whisk it together with a wire whisk to make sure the salt and sugar are distributed evenly throughout the flour. Add the canola oil and mix it into the flour mixture with your fingers until it disappears. It will cause the flour mixture to become slightly crumbly. Continuing to use your hands, work the butter into the flour mixture using quick motions where you flatten the pieces of butter between your hands as you slide your hands apart (one toward you, one away from you). Continue to use your hands as you add the cold water and lemon juice to the bowl and mix these wet ingredients into the dry ingredients. Using your hands at this stage is the best way to know exactly when the dough begins to form as the wet and dry ingredients combine so you can stop mixing. Remember: use your hands, but handle the dough as little as possible. Over-mixing leads to tough, dry, pie crust. Just as soon as the dough begins to form and the flour has almost disappeared, dump the dough onto a lightly floured work surface and shape the dough into two round disks. Wrap each disk of dough in plastic wrap and place them in the fridge to chill overnight. The next day when you’re ready to begin baking your pie, begin by preparing the filling first. Peel and slice your apples, chop the cranberries and add all the fruit to a large bowl. Add the sugars, the cornstarch, spices and the chunks of butter to the fruit and toss everything together with a wooden spoon until it’s mixed thoroughly. Set the filling aside and turn on your oven to 400 degrees Fahrenheit. Grab the two disks of chilled pie dough. Flour your work surface lightly and unwrap the disks of dough, setting one of them aside for now. Holding your rolling pin in one hand, bang the disk of dough a few times, just until it appears to soften slightly. Add a touch more flour if you need to, and flour your rolling pin as well. Roll out the dough until it forms a circle that’s about 13-inches in diameter. The key here is to roll a few times and then turn the dough a quarter turn, roll a little more and then turn it another quarter turn in the same direction. Continue this motion until the dough rolls out to the desired size. Gently fold the dough in half and unfold it over the pie dish you’ll be using. My dish is about 11.5 inches in diameter from edge to edge. Lightly press the dough into the bottom of the pie dish, helping the dough lay flat against the bottom and sides of the dish. Sprinkle the rolled oats onto the bottom of the raw crust. This will prevent the dreaded soggy pie crust. Pour the apple and cranberry filling mixture into the pie dish, making sure you scrape out the bowl to get all those fruit juices into the pie. Don’t press the filling down into the bottom of the dish – just let it sit gently, but try to make sure the fruit is evenly distributed and there aren’t any giant pieces sticking up that would interfere with the upper crust. In the same way you rolled out the first disk of dough, roll out the second to the same size and shape. Fold it in half and drape it over the top of the filling. Go around the edges and trim any pieces that are very large and uneven, but leave a raw overhanging edge. Once the raw edges are even, fold both the top and bottom piece of dough under just until the new clean edge reaches the edge of the pie dish. Continue folding all the way around the pie until your edge looks clean and even all the way around. To flute the pie crust, lightly lift the edge of the dough, pinching the bottom edge between your thumb and index finger while lightly pushing the index finger on your opposite hand toward those fingers. Cut a medium-sized vent hole in the very centre of the upper crust. Combine an egg yolk and 2 tsp of water in a small dish and whisk them together. Using a pastry brush, brush on a SMALL amount of egg wash onto the top crust of the pie and around the edges. Sprinkle a little bit of turbinado sugar (very coarse sugar) onto the top of the pie after you’ve brushed on the egg wash.
Bake your pie at 400 degrees Fahrenheit for 10 minutes and then reduce the heat to 375 Fahrenheit and bake for 45-50 minutes longer. This pie cuts nicely into 12 large pieces, and each piece is only 11 Weight Watchers PointsPlus, making it a safe choice for a holiday treat. And if you divide the pie into 16 slices, each slice is only 8 PointsPlus.